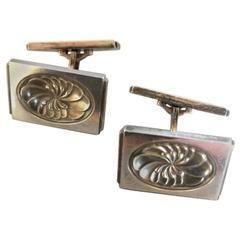 A pair of Georg Jensen art deco cufflinks in sterling silver. 1933-1944. In very good condition. Early stamp. Diameter: 21 mm. A pair of Georg Jensen art deco cufflinks in sterling silver. 1933-1944. Model number 62a. In very good condition. Early stamp. Measuring: 15 x 15 mm. GEORG JENSEN. Brooch of silver in the form of a bird. Model number 211. 1933-1944. In very good condition. Measures: 6,7 x 2 cm. Early stamp. Georg Jensen. Ring of sterling silver. Ring size approx. 8,5 US. Measures : 20 mm. Model number 128. In perfect condition. Stamped. Rectangular with indention down the center and with toggle fastener. Impressed GEORG JENSEN in oval/ 925 S/ DENMARK/ 114. 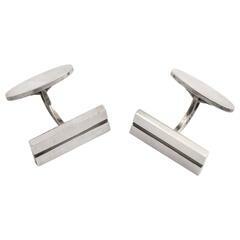 Georg Jensen Sterling Silver Cuff Links No 9. Measures 1.6 cm / 0 5/8 in. Weighs 7.9 g / 0.28 oz. Sterling silver ring crafted by Georg Jensen. Brand new with packaging. Cufflink top measures 32mm long x 8mm at widest point and weigh 14.9 grams. Marked 925 S, Georg Jensen 608C. Georg Jensen Sterling Silver Cufflinks No 107. Measures 2 cm / 0 25/32 in. diameter. Combined weight of 17.2 g / 0.61 oz. Georg Jensen Sterling Silver Cufflinks No 61. From 1932-1944. Measures 1.6 cm / 0 5/8 in. Combined weight 10.3 g / 0.36 oz. In great condition. Georg Jensen Sterling Silver Cuff Links No 114. Measures 2.2 cm / 0 55/64 in. Combined weight 14.5 g / 0.51 oz.